The skies were clear in town on Saturday night so I got in some observing on the Orion Nebula despite the 12 deg temps. I used my new narrowband filter and it made the nebulosity much more noticeable, can't wait to try it on more objects. The seeing was pretty steady and I saw the 'F' star in the Trapezium for the first time. 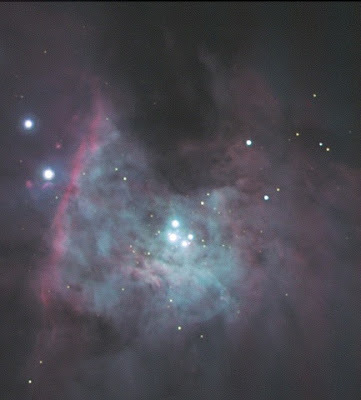 Here's an image of the Trapezium I took last Winter.